Putting our Mark on the Green Industry for over 30 years! Expert design and attention to detail. This is what Greenmark Landscaping is all about. 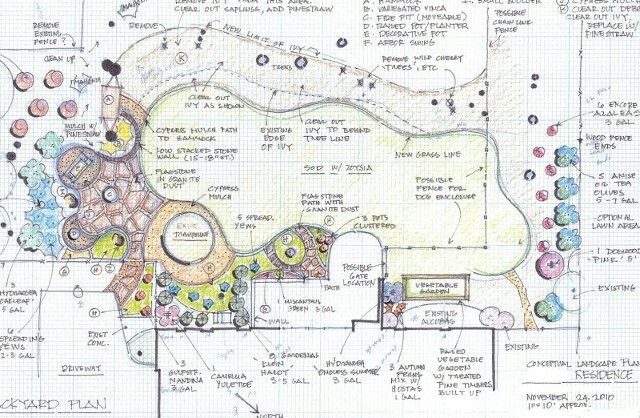 A landscape plan is the starting point for all great landscapes. Greenmark's designers and experienced staff are serious craftsmen who use their skills to provide superior landscaping. Our professional design team will transform your outdoor area into "living" space you can enjoy for a lifetime. We begin the process with an onsite consultation to discuss your individual landscape wants and needs. We will consider all aspects and features of your landscape. From paver driveways, walkways and terraces to trees, plantings, flower beds and water features, we will create the outdoor environment you have been dreaming of. We will never compromise the design process by rushing this most important stage. Landscape designs are generally billed at a fixed cost. Typical landscaped design plans start as low as $380.00. Depending upon the level of detail required, our plans range from an 11" x 17" all the way up to a full size 30" x 42" Plan. To insure a professional, healthy and beautiful landscape you can be proud of and enjoy for years, call Greenmark today at 770-804-9900 or 404-CUT-LAWN to set up your initial design consultation, or click here. Greenmark services Apharetta, Midtown, Buckhead, Chastain Park, Roswell, Sandy Springs, Brookhaven, Chamblee, Doraville, Dunwoody, Duluth and Norcross.